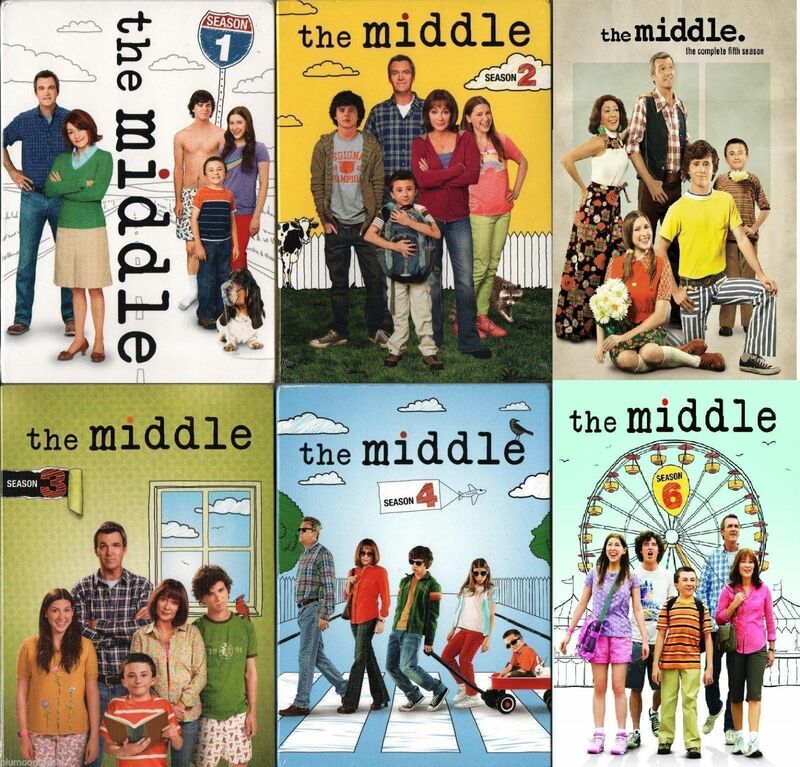 The Middle TV Series Complete Season 1 2 3 4 5 6 DVD Set TV Bundle Collection R1 Genuine U.S. Retail Release, Brand New, Original Factory Sealed Product Details Season 1 Special Features Raising a Sitcom Family: Series creators recount the history and development of this unique comedy about small-town life in the Midwest Sue's Best Shots: Sue's school photos provide the springboard for cast and crew to recall their own school photo experiences Unaired scenes Gag reel Actors: Patricia Heaton, Neil Flynn, Charlie McDermott, Eden Sher, Atticus Shaffer Format: Multiple Formats, AC-3, Box set, Color, Dolby, Subtitled, Widescreen, NTSC Language: English (Dolby Digital 5.1) Subtitles: English, French, Spanish Dubbed: Portuguese Region: Region 1 (U.S. and Canada only.) Aspect Ratio: 1.78:1 Number of discs: 3 Rated: NR (Not Rated) Studio: Warner Home Video DVD Release Date: August 31, 2010 Run Time: 528 minutes Patricia Heaton stars as Frankie Heck in this warm and witty single-camera comedy about raising a family and lowering your expectations. Frankie Heck is a superhero. Well, no, not an actual superhero - but sometimes it seems to Frankie as though getting her kids out the door for school every morning is a superheroic act. Middle aged, middle class and living in the middle of the country, this harried wife and working mother of three uses her wry wit and sense of humor to try to get her family through each day intact. Season 2 Special Features Unaired Scenes Gag Reel Actors: Patricia Heaton Format: Multiple Formats, AC-3, Box set, Color, Dolby, Dubbed, NTSC, Subtitled, Widescreen Language: English Subtitles: Chinese, French, Portuguese, Spanish Dubbed: Portuguese Region: Region 1 (U.S. and Canada only.) Number of discs: 3 Rated: NR (Not Rated) Studio: Warner DVD Release Date: September 27, 2011 Run Time: 528 minutes Work. Kids. Bills. Comedy. It’s how the middle half lives. The Heck family returns for Season Two, bringing with them 24 episodes of offbeat fun with one foot in reality and the other on a greasy wrapper from Burgerworld. Patricia Heaton and Neil Flynn star as Frankie and Mike Heck, frazzled parents trying to stretch their patience and paychecks around three brilliantly true-to-life kids: Axl, whose latest dream girl has tattoos, body piercings and pink hair; Sue, who’s thrilled to come in eighth (out of eight) in Square Dancing with the Stars; and Brick, the only kid who has his birthday party at the public library. Season 3 Actors: Patricia Heaton, Neil Flynn Format: Multiple Formats, AC-3, Box set, Color, Dolby, Full Screen, NTSC, Subtitled, Widescreen Language: English Subtitles: English, French, Portuguese, Spanish Region: Region 1 (U.S. and Canada only.) Aspect Ratio: 1.78:1 Number of discs: 3 Rated: NR (Not Rated) Studio: Warner Home Video DVD Release Date: October 8, 2013 Run Time: 528 minutes Season 4 Special Features Unaired Scenes Gag Reel Actors: Patricia Heaton, Neil Flynn, Charlie McDermott, Eden Sher, Atticus Shaffer Producers: DeAnn Heline, Eileen Heisler Format: Multiple Formats, Box set, Color, Full Screen, NTSC, Widescreen Language: English Subtitles: Spanish, French, English Region: Region 1 (U.S. and Canada only.) Number of discs: 3 Rated: NR (Not Rated) Studio: Warner Home Video DVD Release Date: February 25, 2014 Run Time: 512 minutes The Middle: The Complete Fourth Season Patricia Heaton, Neil Flynn, Charlie McDermott, Eden Sher and Atticus Shaffer star as the middle class, middle of the country (i.e. Orson, Indiana) Heck family in this warm and witty comedy about raising a family and lowering your expectations. While Frankie continues to struggle selling cars at the only remaining car dealer in town, an unexpected turn of events might force her to reevaluate her career path. Axl's slothlike days are numbered, now that Mike's made it his mission to ensure that his oldest son somehow earns a sports scholarship and goes to college next year. Meanwhile, Sue's not only navigating high school, but wants to navigate Indiana roads – by getting her driver's license. It's no wonder that youngest son Brick keeps his nose in a book! Season 5 Actors: Patricia Heaton, Neil Flynn, Charlie Mcdermott, Eden Sher, Atticus Shaffer Format: NTSC Language: English Region: All Regions Aspect Ratio: 1.78:1 Number of discs: 3 Rated: PG-13 (Parental Guidance Suggested) Studio: Warner Archive Collection DVD Release Date: October 7, 2014 Run Time: 518 minutes The quirky misadventures of one of the Heartland’s most hilarious families continue as the middle returns for a fifth fitful season… and family dynamics have never been funnier. 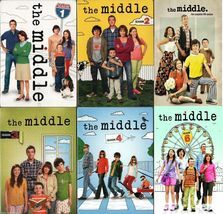 As the middle-aged, middle-class, middle of the country mom, Frankie Heck (Patricia Heaton) tackles the mundane chaos of everyday life, her kids – recent high school graduate Axl (Charlie McDermott), sophomore Sue (Eden Sher) and the quirky middle-schooler Brick (Atticus Shaffer) – are continually manufacturing drama, while her laconic husband, Mike (Neal Flynn) offers support from the sidelines (re. the living room couch). Juggling her new job as a dental assistant with school projects, teenage theatrics and a husband in emotional low gear, Frankie struggles to use her wry wit and sense of humor to get her family through each day intact. But through all the madness, the Hecks muddle through…and together they’re keeping the middle on the map. Season 6 Actors: Patricia Heaton, Neil Flynn, Charlie McDermott, Eden Sher, Atticus Shaffer Format: NTSC Language: English Region: All Regions Number of discs: 3 Studio: Warner Archive Collection DVD Release Date: October 27, 2015 Run Time: 519 minutes It's Season Six, and as the kids keep getting older, Frankie and Mike (Patricia Heaton and Neil Flynn) think family life is going to get easier, but they couldn't be more wrong! Bigger kids only means bigger problems! With Brick (Atticus Shaffer) starting seventh grade as well as a new relationship (with girl! ), there Just might be hope for him (whoop!). Meanwhile , it's the "year of sue" and Sue (Eden Sher) is navigating her way through her senior year of high school with blissful abandon, and Axl (Charlie McDermott) is still figuring out all the angles in his college experience, while Frankie and Mike muddle their way through middle-age, middle-income Middle America. But be warned: Whatever the Hecks do, do not attempt it at home. Our items are shipped from multiple locations; we tend to ship from the the states that are closest to your location if we have the ordered items in those states. All of our items are 100% GUARANTEED AUTHENTIC US RETAIL DVDS OR BLU-RAYS (Either Region 1 or All Regions made for United States Canada); we do not sell copies or bootlegs! They are all purchased directly from U.S. authorized suppliers, distributors and warehouses. PayPal only. It is your best protection as a buyer. Payment Method Shipping Handling Terms Free standard shipping to the Continental USA Only. No PO/APO Boxes. Trust also in our fast customer service, providing immediate assistance if necessary. International Shipping: We will work with's Global Shipping Program on eligible items. will charge fees and manage the shipment once they receive the package.